Boldly going where I have not gone before. I am journaling these days in a way I haven’t been able to in years, just recording the day as it flows past, honoring the moments I am living and trying to be as present as possible. In doing so, I realize how far I have drifted from my original intentions with my journals, and how sporadic my practice has become,. Now I can easily fill up several spreads a day and it is a rich and fun experience. I am also experimenting with my line quality, going for a bolder, more immediate feel. i am using Sharpies, my wider Lamy Safari, bamboo pens, and a juicy “Big Brush” PITT artist pen from Faber- Castell. And finally, thanks to my new garage/studio, I have the luxury of just reaching down into a handy drawer and grabbing a palette loaded with gouache and painting myself a fresh glass of lemonade. Previous Post The art of living. Next Post Seeing the light. shared your post on Facebook with the KW Urban Sketchers in Kitchener, Canada. I admire the storytelling and your cool funky font. You can check us out at https://www.facebook.com/groups/KWUrbanSketchers/. 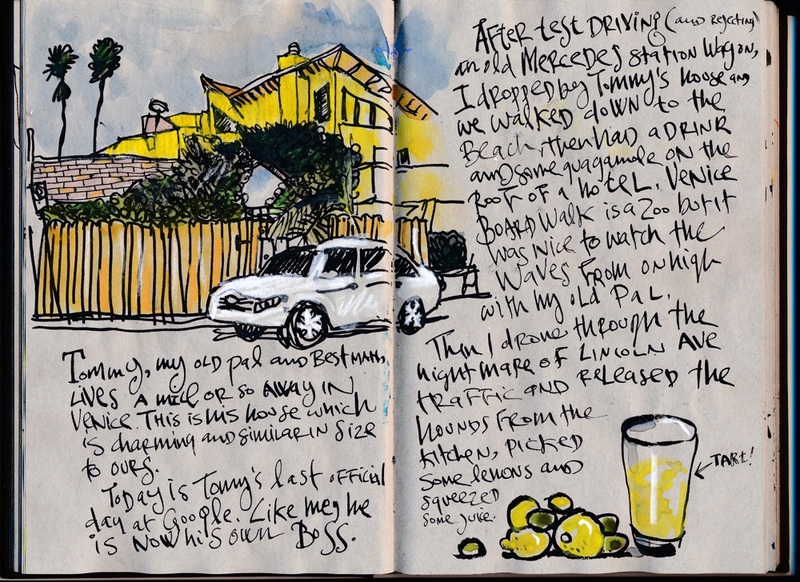 I too so enjoy your art journal entries, your style of making art, the sharing you do that continues to inspire me (us). where we are drawing via Google Street Maps all over the world. Each artists who joins us, and it would be so cool if you did, has the opportunity to choose a place to draw for two weeks at a time. You could bring us all to LA with you! Or go back to NY virtually, or anywhere else that excites your mind and pen! It sounds like you and I live quite close to each other. I live near Venice High School. I keep reading and trying to catch any hint as to where in Socal you’ve moved to. Welcome to Socal. You’re on a role, Danny. I had wondered when you would start to get the colour going. That’s what first really jumped out at me with your book A Kiss Before You Go. Now you’ve got the line down – like a having a good drummer in a band – you can freak out on lead guitar with your colour. Your last line reminds me of my favorite book from my childhood, Harold and the Purple Crayon. Very much enjoy your entries. Thanks for keeping this up! Another great post, Danny. It must feel wonderful to be enjoying your journaling again on a more regular basis. That’s great, I hope you’ll be riding that flow for a while! Reblogged this on Through The Artist's Eyes. So, I’m guessing that you’re enjoying life in LA? It was hard for me to adapt to AZ from CT. I miss the Northeast way of living, and don’t enjoy extreme hot summers here in AZ. I do like that I can plan more outdoor stuff in the winter though.